Guitar, a popular musical instrument for musicians to play songs where ever they want. As we know, guitar works on metal or nylon string and need to tuned intermittently to get the desired sound for songs. 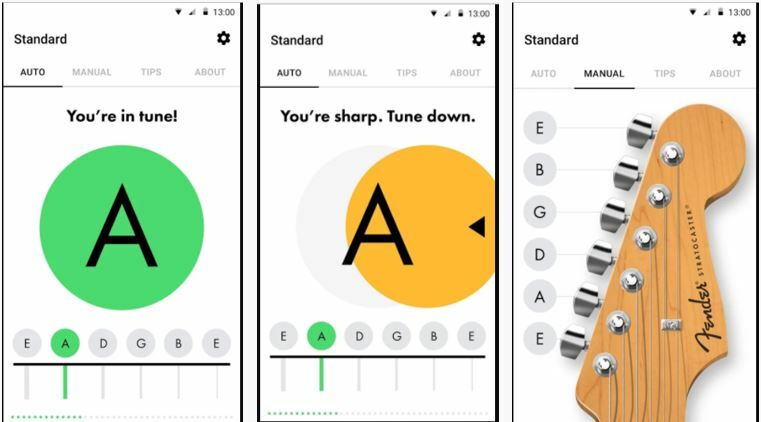 You don’t need to buy costly electronic devices to tune your guitar when enough best free guitar tuner apps are available for both Android and iPhone smartphones. You can download any free guitar tuner app from Google play store, App store or your respective mobile app store. 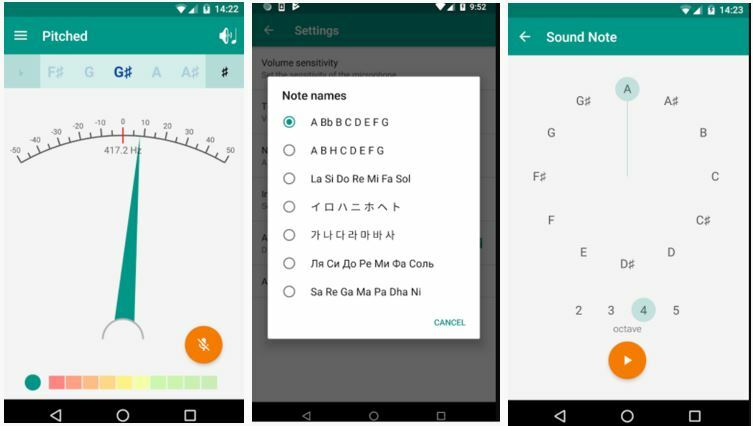 After installing the guitar tuner app, your smartphone’s microphone will use to grab the sound to identify the notes and their accuracy. It doesn’t matter whether you want the acoustic guitar tuning or electric guitar tuning, these digital guitar tuner apps work for both. Note: All these free guitar apps for Android may perform differently on different Android devices because of Microphone specifications and configuration of different vendors. 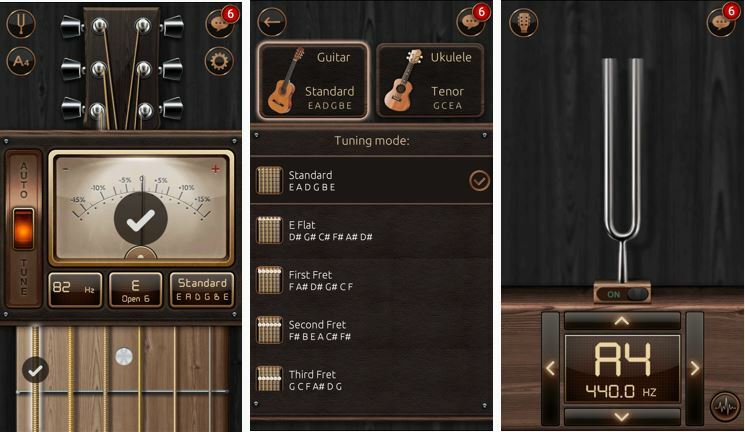 Guitar Tuna is the ultimate app that can use by any beginner to tune both acoustic and electric guitars. I personally used it to tune my guitar. I am using the acoustic and really it did a good job for me. 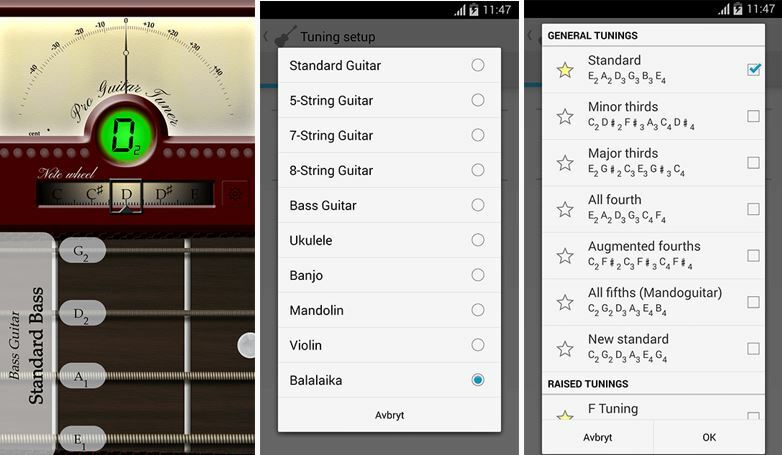 The GutarTuna app’s free version provides a tuner for guitar, bass 4 & 5 string, Ukela & Cavaquinho, Custom Tuning, Guitar 7 7 12 string, Violin Family and Folk instruments. 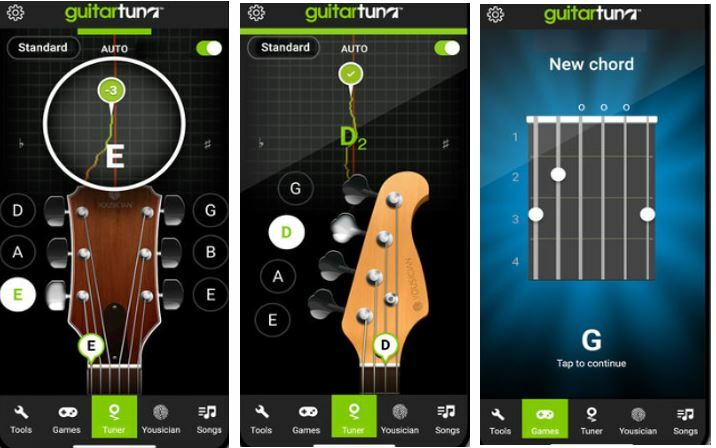 If you are a beginner then you definitely have to download this guitar tuner on your mobile because it has an inbuilt game that helps you to remember the strings pattern. It features Auto mode tuner for super fast tuning, hands-free, and string by string. Learn Guitar Songs: 4 songs with guitar notation (tabs). Works with Electric and acoustic guitars, Bass, Mandolin, Ukulele, Viola, Violin, Cello, Fiddle, Balalaika, Banjo and more. It is another best Guitar Tuner App for Android and iPhone. On the App store, it is available with a name of Pro guitar tuner Lite. The best thing is that this guitar tuner app is also available for pc. Basically, the Pro guitar has an online website called proguitar.com. One can open this website on their Laptop or Pc no matter it is Windows, MacOS or Linux because it works in the browser. After visiting the website go to the tools section and select the web guitar tuner. In this way, you can use this guitar tuner on the computer as well as on your mobile. The interface of the app gives vintage feeling with a needle that up and down to show the pitch of the sound while apart from the chromatic scale the note wheel, red/green light pitch indicator, and fretboard is also given. Pro Guitar is a chromatic tuner app that can tune a wide range of stringed instruments such as s guitar, Standard Guitar, 5-String Guitar, 7-String Guitar, 8-String Guitar, Bass Guitar, Ukulele, Banjo, Mandolin, Violin and more. It can be used as both modern and classical guitar tuner. Chromatic Guitar Tuner helps you to tune your electric or acoustic guitar with help of several modes such as Automatic Mode, Chromatic Tuner Mode (Tune by Ear), Pitchfork (tuning fork generates a frequency from 1 hertz to 22050 Hz), Tuning Presets, Alternate Guitar: E Flat (half step down), First Fret, Open C, Open D, Modal D, Minor Third, Drop D, Major Third and other drop tunings. Chromatic Guitar Tuner app available for Android only. Fender Tune is another good free Guitar tuner app for Android and iPhone but still a bit less easy than three above in case of tunning and that’s why it is at the 4th no. in our list of free guitar apps. Besides the mobile app, it is also available as guitar tuner app for a computer that uses the browser and can work on Windows, MacOS, Linux or any other system. However, there are a couple of other features present in this guitar app which makes it worth to try. It is easy to use and the interface of the app is also good. It features 22 different tunings for acoustic, bass, ukulele and electric guitars. As per the developer of the Fender Tune app, it uses a DSP algorithm to enhance the pitch detection. The DSP technology detects low-frequency pitches faster than others. Like other two Guitar Apps, I mentioned above it also uses the smartphone mic to detect the Guitar strings pitch and guides you to tune them properly but I find a bit problem in the Fender Tune app while tunning my acoustic guitar as compared to GuitarTub and Pro guitar. Also, the Fender Tune App features a string-by-string diagram guides through your selected tuning, Manual Tunning Mode by hearing the sound and tune by yourself, Chromatic Mode recognizes each of the 12 chromatic (semitone) steps of the equal-tempered scale, Custom Tunings and Pre-Set of 26 tunings that include Standard, DADGAD, Open G, Drop C, Drop D, Full step, Half step, Half step up, Half step down, and more. Pitched Tuner is here because of its capability to tune and representation of Note names. It can represent the notation in several languages like English, Portuguese, Indian(Sa Re Ga Ma Pa Dha Ni) and more. It works with a wide range of instruments like strings, woodwind, brass, guitars, voice, and more. This guitar tuner app has two mode Instrument tuner and Chromatic Tuner. Like others mentioned above the Pitched Tuner can also be used to tune common string instruments such as banjo, bass 4, 5 and 6 string, cello, double bass, guitar including 7 string, ukulele, viola, and violin. 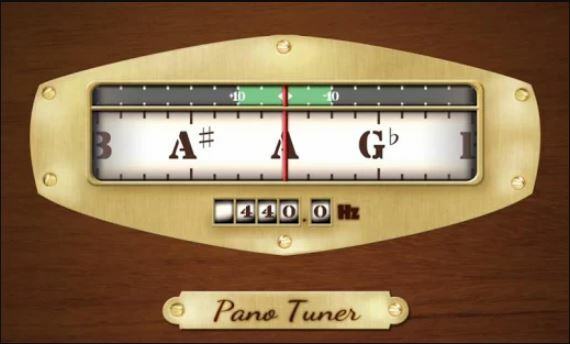 The interface of this app has a traditional tuner needle and dial which fluctuate to clearly shows the frequency coming out through the strings of the Guitar. You can also set the microphone sensitivity to Medium, Low, or High from the settings of this guitar app. A separate volume indicator tells you how clearly the microphone is picking up your instrument sound. Customizing the tuning pitch from the common 440Hz and adjusting it for non-concert pitch instruments, for example, the B-flat trumpet. It is the simplest free guitar tuning app that has a simple interface to shows on which frequency you are playing a note on a guitar string; then according to that, you can tune your guitar. If you are just looking for a tuner with accuracy the Pano Tuner can make a room to install on your smartphone. You can tune your guitars, upright basses, trumpets, and piccolos. This free simple guitar app available for both Android and iPhone iOS users.